A new DLC pack has launched for the medieval RPG Kingdom Come: Deliverance, and, in typical Kingdom Come fashion, it’s all about a Band of Bastards. This third DLC for Deliverance once again starts with Henry setting out to help Lord Koybyla – this time aiming to settle a feud between Radzig and another noble family vying for its position. To help protect the realm, Radzig hires the titular Band of Bastards – lead by Sir Kuno Baron von Rychwald. Needless to say, much adventuring, ribaldry and bloodshed ensues. The focus here is on combat, mostly consisting of small skirmishes and duels. Some new gameplay layers are available here too, notably some stealth missions and new side-quests. Fans of Kingdom Come’s branching storylines will be pleased to learn that there will be plenty of dialogue options on offer throughout the new quest line, including choice-sensitive ‘twists’ and endings. 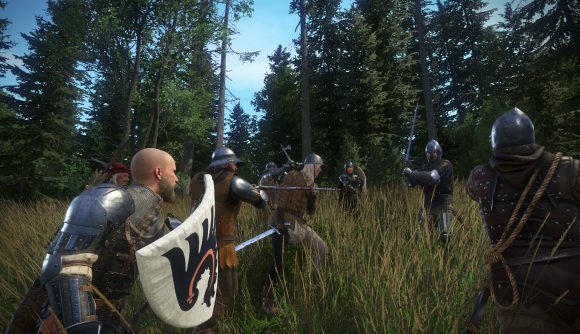 The DLC is said to be about five hours in length and is accessible once you have completed the Baptism of Fire quest, which is about one-third of the way through the Kingdom Come: Deliverance main quest line. Band of Bastards is available now on Steam and will run you $7.99. This release follows up two previous DLC packs, From the Ashes and The Amorous Adventures of the Bold Sir Hans Capon. The fourth and final DLC is scheduled for later this year. Entitled A Woman’s Lot, this new quest line will put players into the shoes of a female character for the first time.